As for me I got an extra couple of MELD points. So I am next to go. #1 for sure. All is well. I was in my Vistage meeting at 1:15 when Nina called from the transplant center. I was in Riverside, Nancy was with Annie at her Baby doc’s appointment, and Laurie at her office. They found a liver. It was local, here in Chicago, but it was on a very short notification. I had to be at NW by 3PM. They were sending the harvest team out and said they would know by 4PM for a go/no go decision. We arrived on time to see all of our familiar faces. They did all of the vitals, blood work, etc. I was ready for more tubes and catheters (ouch!). Then the harvest team called me from their location to say it was the worst liver they have seen for a long time and they turned it down. I was dressed and leaving just as the nurses’ station was advised. SO – my wrist bands were cut off and we came back to the Condo. This time I got my Pizza. Uno’s deep dish cheese and sausage. Now Laurie’s house closing is back on for 9AM tomorrow and we told Annie it was OK to have her baby now. Tomorrow is her due date. Lot’s going on in the Dickinson household! As for me, I am going to take a hot shower and then watch Glenn Beck. Stayed tuned for the next chapter of – As the Liver Turns…. Well, it was the night that wasn’t …. We learned a lot one our dry run. First, there is no pizza place open in Chicago at 4:30 AM but the Cinnabon guys are taking their freshly baked goods out of the oven, which at 4:30 AM is better for you. I understand there is always a 10-20% chance that the liver isn’t “good enough”, and in my case apparently the blood vessels on the donor organ were not as pliable as they like — so it went back into the organ bank for distribution. Once NMH had a patient that had eight dry runs! I bet he was very good at preparation. The process is very impressive. They’ve got their protocols and these guys know what they are doing. From the time I walked into the door it was a finely tuned process – like an orchestra. Nothing is left for error. The nurses are very sharp and know their stuff. It reminds of a checklist for a Citation X. To memorialize our evening we shot a picture of the participants. 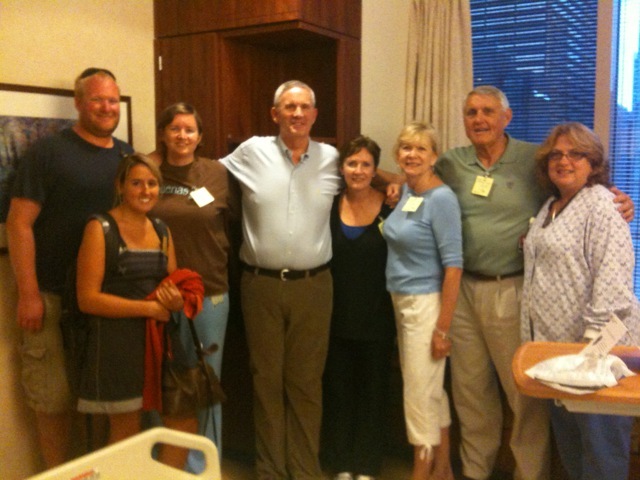 From the left to right – Rob, Vanessa, Laurie, Dan, Nancy, Vickie, Dean, and my nurse. Annie and Will had not arrived when the photo was shot. As I said before, we were blessed and very grateful to have our friends Dean and Vickie with us. Dean has his own version of events in his blog at http://deanrush.com/ . I haven’t read his book yet as the release date is next week, but I ordered a bunch of copies to give away. He has been an inspiration to many. As for me, I have been busy at the office and plan on being normal. I’ll just wait for the next call — the fork in the road — and I’ll take it. Thank you all for your very kind words. Guess what. We are going home. They did the harvest, and they were not happy with the blood vessels of the donor liver so they turned down the liver. So we will walk home and see if there is a all night pizza joint open. I think Nancy and I are going to take the rest of the day off. Well, now we know the procedure! This is Annie blogging for dad, per his request. Things stand now exactly where they were when dad first announced the big news on the blog. The procurement surgery on the donor has been postponed due to an emergency at that hospital. It looks like dads surgery could be as late as 8 AM tomorrow. Once we get word that procurement has happened the surgery will happen quickly. Well, it 10:20 and still waiting for word on the visual inspection. For me I don’t feel any different now than before. My BP is 150/90. It has never been that high ever, so I guess there is a little anxiety. Things will move fast once it is a final go, but it is unlikely it won’t happen. Interestingly, I am fearless about this.. Thanks all from everyone for the kind words. Oh, Elyse, Laurie, and Annie will have my e mail. We are lucky Dean and Vickie stayed over with us. Everyone is in the room eating sandwiches. I asked for my 5 pct but they said no! Everyone is clicking away on their ipads here. I got a call at 4PM today. The donor liver is from a non-cardiac death. They have already completed the donor family interviews and have done the various tests and biopsies on the donor liver. It is less than 5% fat and not high risk (that’s a good thing) The only thing left to do it to do a visual on it. I don’t know where the liver is coming from, but it is close because they are not flying it in. Funny, I thought this would be our weekend. Our very close friends from San Antonio are here with us – Dean and Vicki. Dean has been an aviation industry friend of mine for years and an inspiration to me and many others. (plug for his book new book at www.deanrush.com) It is auto biography and a book about facing adversity. Dean is now a pastor at CBC in San Antonio. We were about to leave to drop him off at ORD for their flight home when I got the call, so he is sticking around. Timing is perfect. WOW, what are the chances of that ! SO – here is the plan. We are downtown so we’ll walk over to NMH around 7PM. They are sending the team out for the pre-purchase inspection of the donor liver right now. I’ve already talked to the surgeon and he cancelled his dinner plans to meet me. 80% it is a GO/20% they reject the liver during inspection. Nancy is here, Laurie and Rob will be here soon, and Annie and Will should arrive soon as well. We’ll keep you advised on the blog and I’ll let you know when I turn over the Blog to the care, custody, and control of the kids. Thanks you all for your thoughts and prayers. My plan is to WALK home from the hospital within 36 hours of the surgery.